I built this for a friend of mine the other weekend. It was a fairly simple, straightforward build, but there are a few things worth mentioning. First, there are no instructions for this baby. Sure, they give you a page with some pictures of the parts, but nothing telling you to insert Tab A into Tab B BEFORE inserting Tab C into Tab D. It would be nice to know if there's a sequence to follow so I don't make building this thing hard on myself. You know, like make sure you add the side fin before you add the vectored nozzle. Sure, I figured it out, but it would have been a little easier if I had a little help. In fact, I've included a scan of the "instructions" so you can see just what they give you, don't worry... there's nothing there you can use. Believe me. Then there are the standard resin operating procedures. Make sure to wash the model well with warm soap and water, trim all of the mold lines, fill in any defects with greenstuff, pin the weak joints, straighten out the bent pieces, etc. With the base I wanted to build something that would be helpful. They included a large flying base with the model. You know, the ones for regular jetbikes... like it's supposed to hold this up. I found a MDF plinth that was just the right size. My friend wanted it hovering right off the tabletop so I went looking for the perfect bolt to connect the model to the base. I found a threaded bolt that was the correct height. One end went though the base and the other went in the underside of the model. Thread them together and I was all set. I did balance the finished model on top of the bolt before drilling to make sure I had just the right spot so the model would sit correctly. 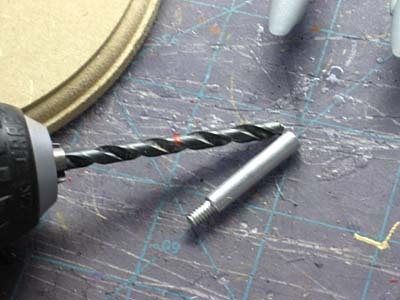 Here's the one tip I have when it comes to drilling out models. If I want to make sure I only drill so far, I'll take the piece I'm fitting into the model and measure it against the drill bit. Then I add a small stripe of bright colored paint to the drill bit marking the depth I'm not to exceed. This way, I never drill any deeper than necessary to fit the piece into the model and I lessen the chance of drilling completely through and having to fix a hole. 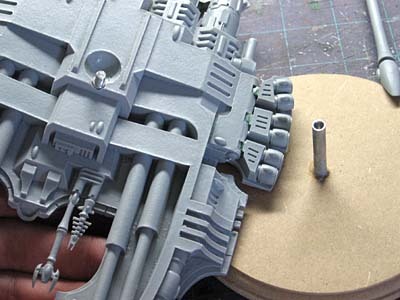 The one last thing I did on this model was to use greenstuff O-rings on certain joints to strengthen the connection. In some places you have to match up two flat surfaces and I've found that by making a small O-ring out of greenstuff and dropping it between the two surfaces before gluing and pressing them together, the greenstuff flattens out and fills in any irregularities and strengthens the connection. 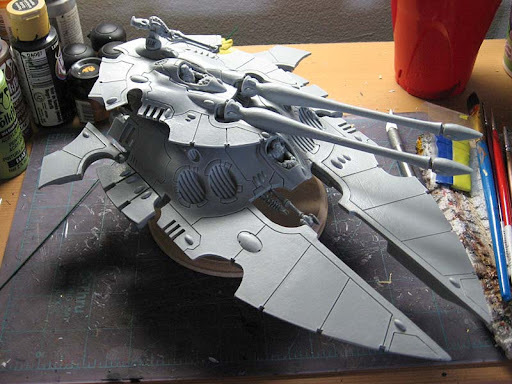 So there it is, an Eldar Scorpion Grav Tank in all it's glory. Lots of detail work, but worth it in the end when you've got a cool looking tank with huge guns. And I magnetized the turret to the tank body, just to make it easier to transport as well. Aw now I want to start Eldar.. the tanks are beautiful. I do like how the turret looks like a small vehicle on it's on in the "instructions"! That's a pretty sweet model. Good tip using the GS too. What craft world will this be? The o-ring seems like one of those simple but brilliant ideas I've never considered...this is why I love reading up on hobby blogs on FTW. Those little tiny toss-away tips that really change my hobby game.